Overdosing on Pink? Can’t Happen! 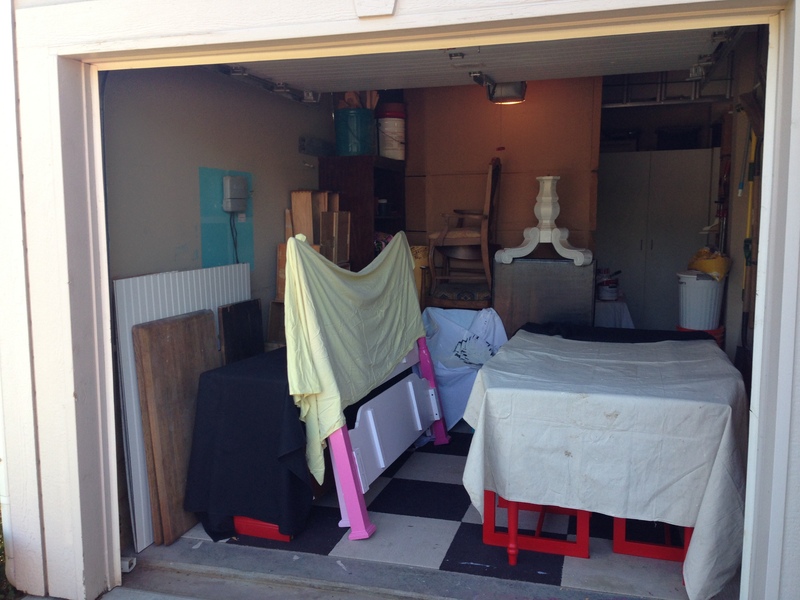 So, I had mentioned in an earlier post that we restocked the garage with furniture pieces. 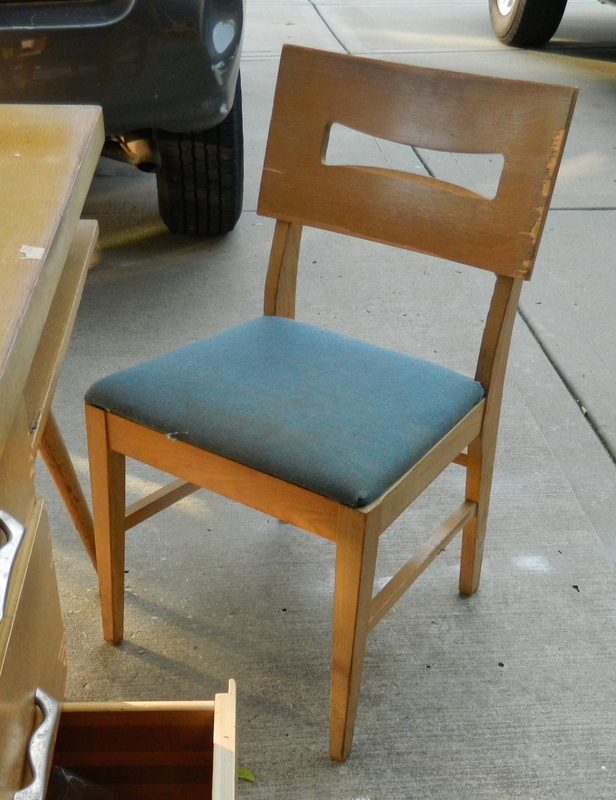 I am in the midst of doing a little test: I want to see if I can really earn enough money from the furniture makeovers and projects to allow me to skip the normal ‘nine to five’. I’ve never been one to sit around all day, but this sabbatical has shown me that I am a little more ready for the slower pace, even if I am not ready to actually “retire”. We actually picked up four of the pieces from one place. I love happy coincidences like this. My general approach to these giveaways is to be kind, considerate and make it convenient for the giver. So, by replying and telling her that I wanted the pieces and that I would be able to pick up at her convenience, I was the receiver! We scheduled the pickup for the next day at noon and when we arrived, we were greeted by two young men who helped us load. 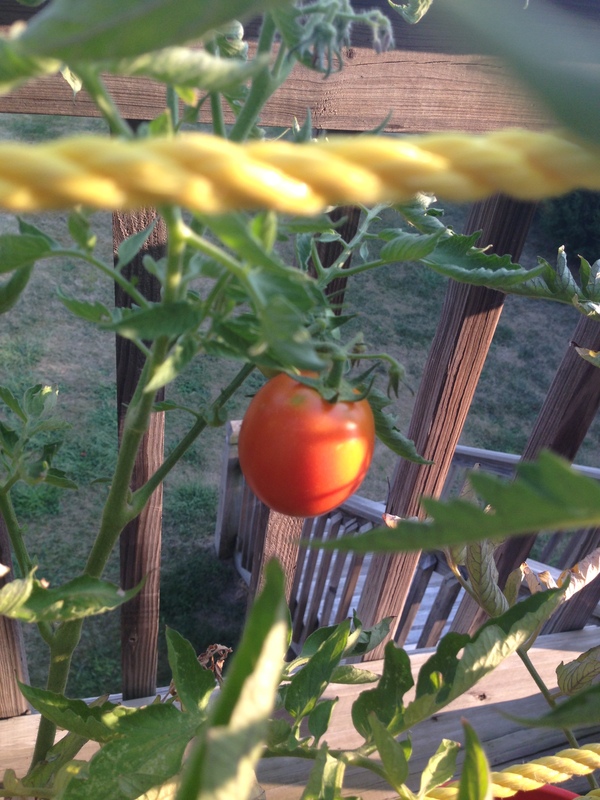 I love when things go like this… feels like good karma. 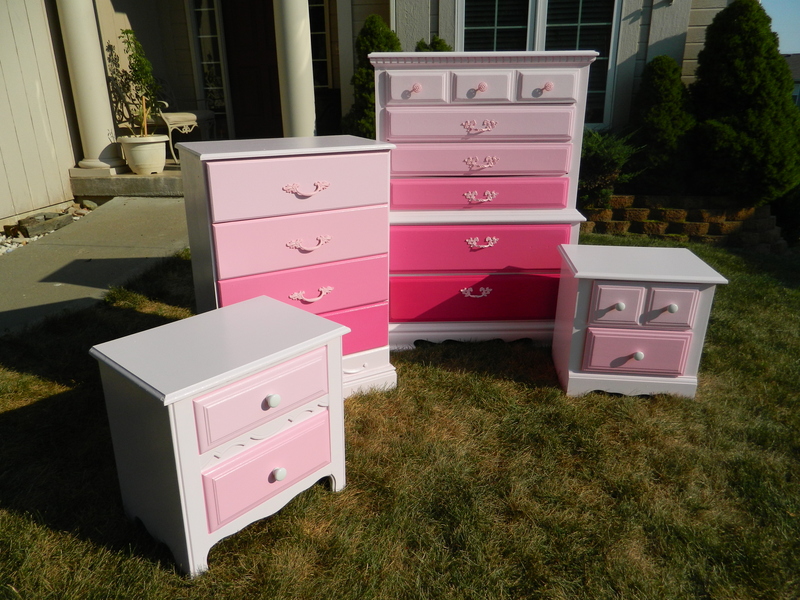 So, there was a six drawer dresser and a matching nightstand and another five drawer dresser also with a matching nightstand. 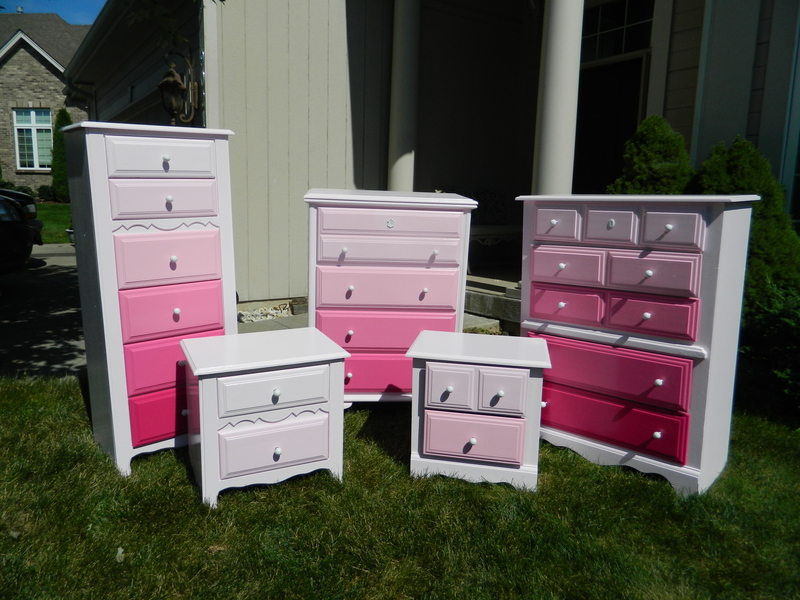 We had picked up a four drawer dresser a couple of days before, so in all, these five pieces became a single project. 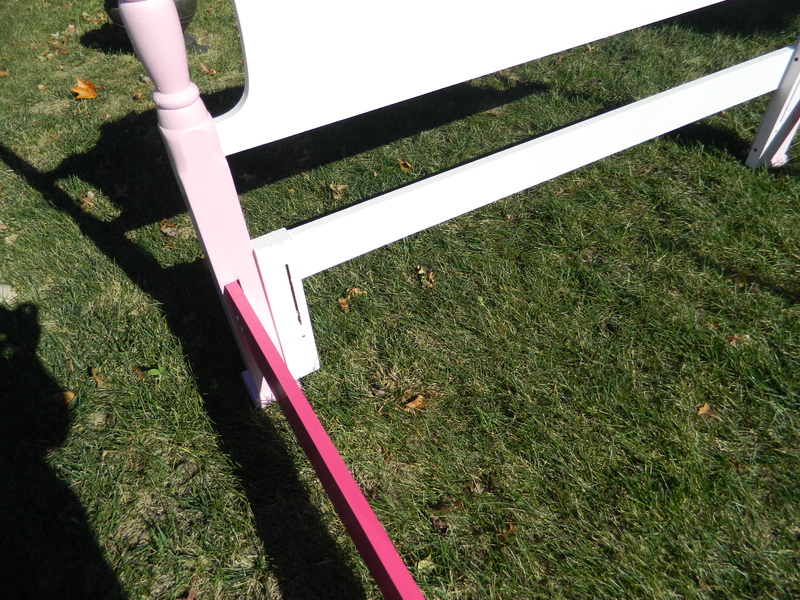 Everything was primed… previously, I had purchased a good primer and had it tinted pink. It turned out a little darker pink than I had really wanted, but it has turned out to be a great color; it is more than obvious if you’ve missed a spot! 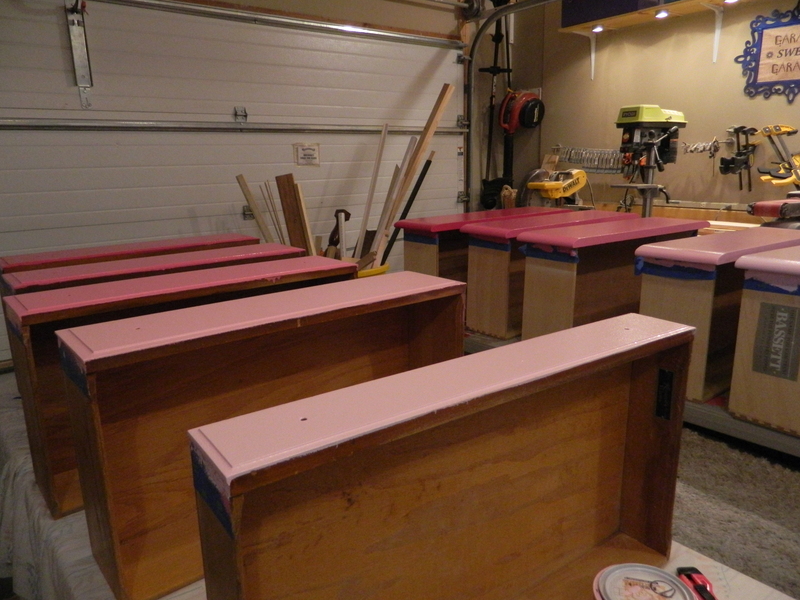 Here was the garage following the priming. The weather has turned very hot and even our unusually cool garage has heated up. So much of the painting occurs either very late in the day or very early in the morning. It doesn’t take much to work up a good sweat! 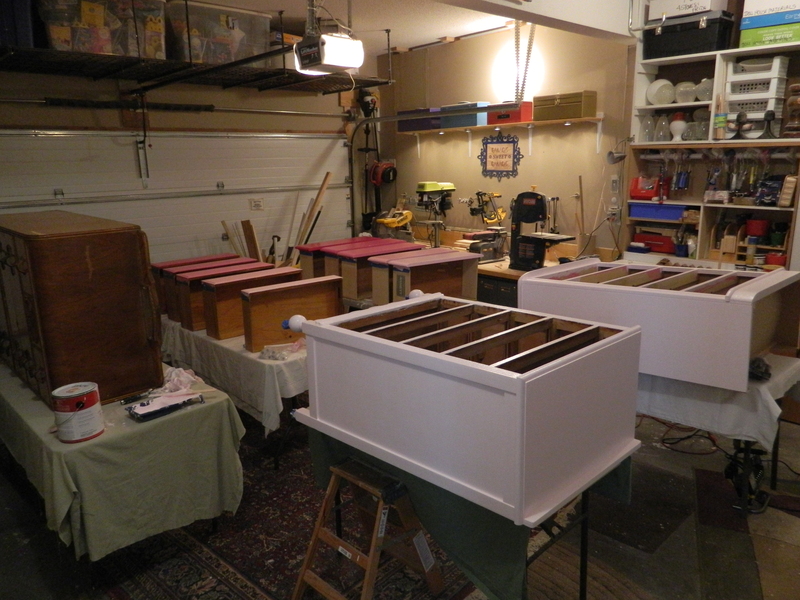 Then it was just a matter of painting the bases and then I organized the drawers to be painted by color. 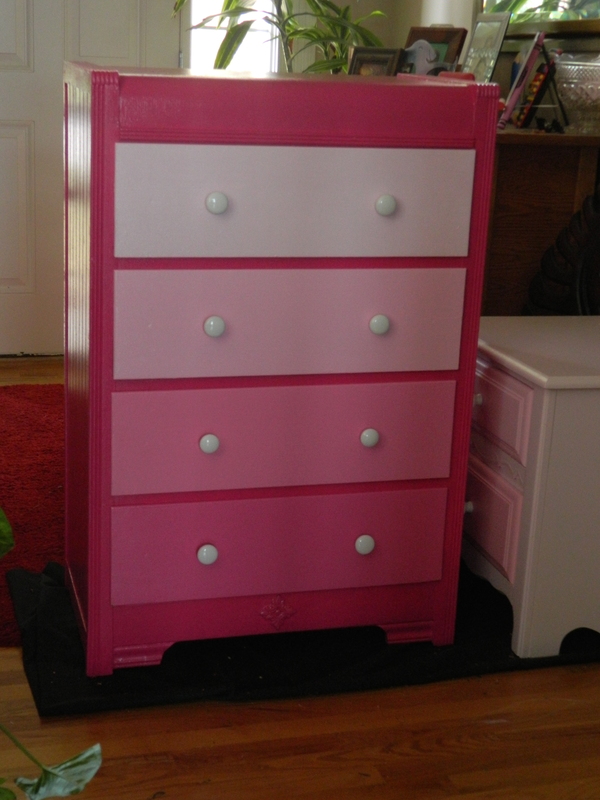 One drawer on the six drawer dresser would have to be painted the same color as the base, since I have just the base and five colors. 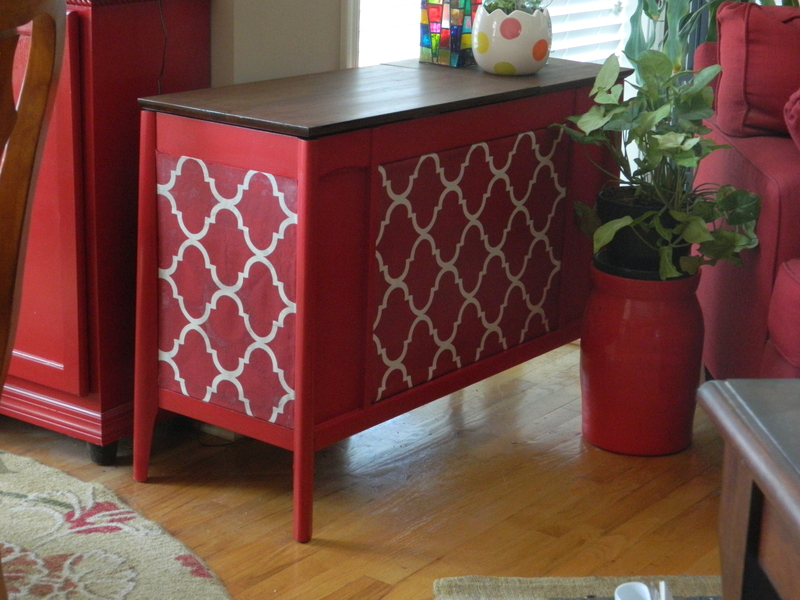 I did the same on its matching nightstand, well, to make it match! 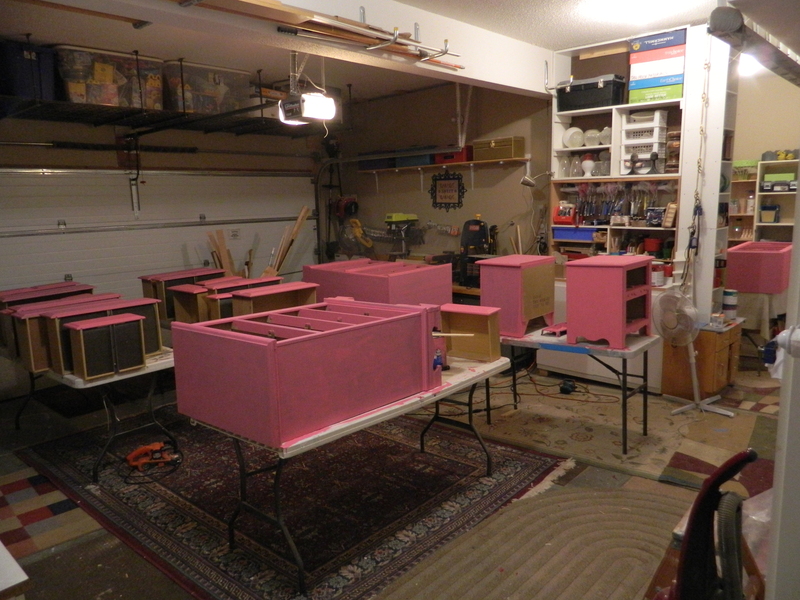 As the drawers go, there was one drawer to be painted the base coat, five to be painted Pink 1, five to be painted Pink 2, four to be painted Pink 3, three to be painted Pink 4 and two to be painted in the deepest shade of Pink (5). 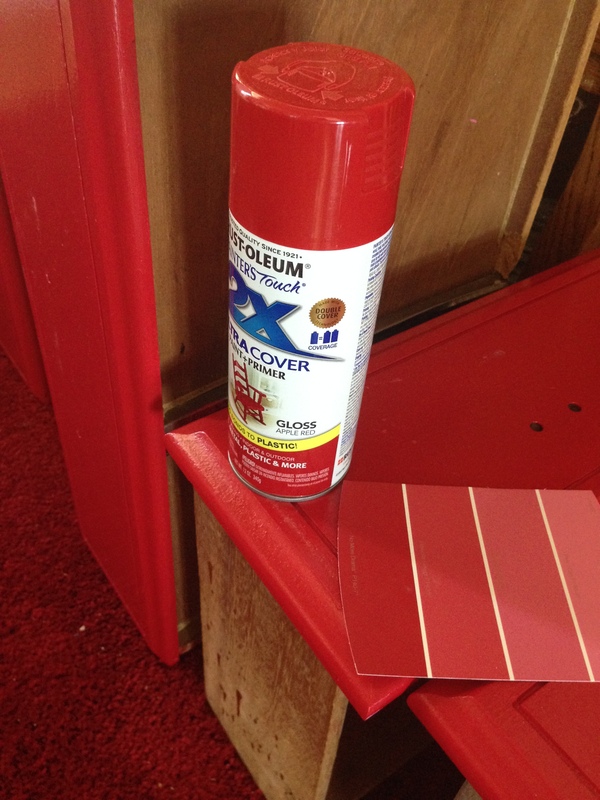 I use Behr Paint from Home Depot. These have been my much used paint colors. The base coat is the Barely Pink, skipped Be Mine and then used Scented Valentine, Pink Chintz, Springtime Bloom, Fuchsia Kiss and Hot Pink. I originally started out using a matte finish, as early on the sample colors only were available in matte. 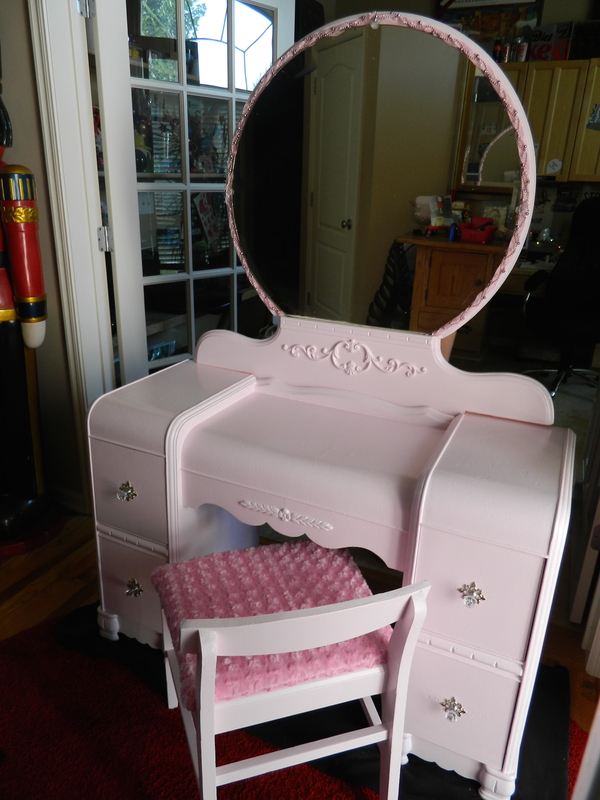 But as I progressed, I found that I preferred the High Gloss finish – not only did it add a shine to the pieces, but I believe it would be better as far as fingerprints go. I still roll on the paint, I love the soft finish it leaves behind. 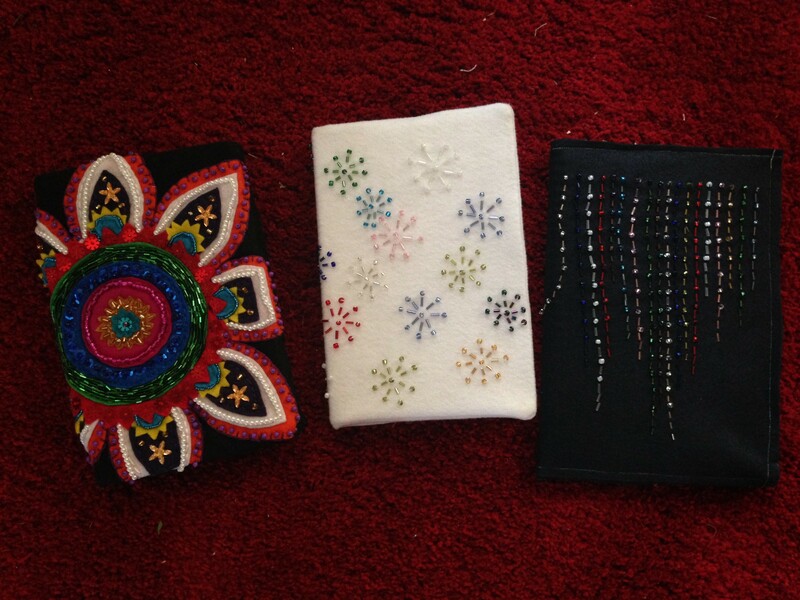 Here are all five pieces completed. There are so many times I’d wished that I had a reason to keep these pieces (or simply make them for myself), but alas, a daughter is not to be. 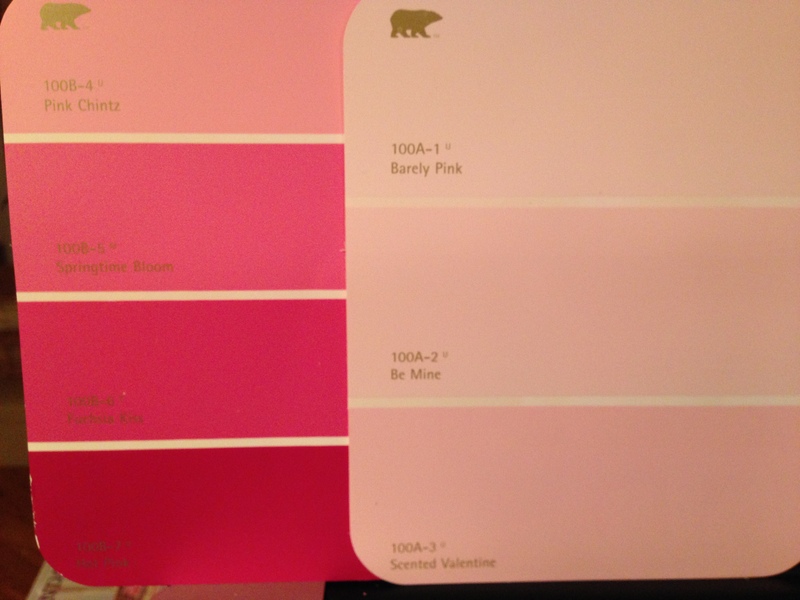 I am very happy with my son, and he let’s me decorate his room to my heart’s content, but there is nothing like these gorgeous shades of pink! These five pieces aren’t exactly the same style but very close. I believe that they are circa 1950’s, and are mostly made of wood. 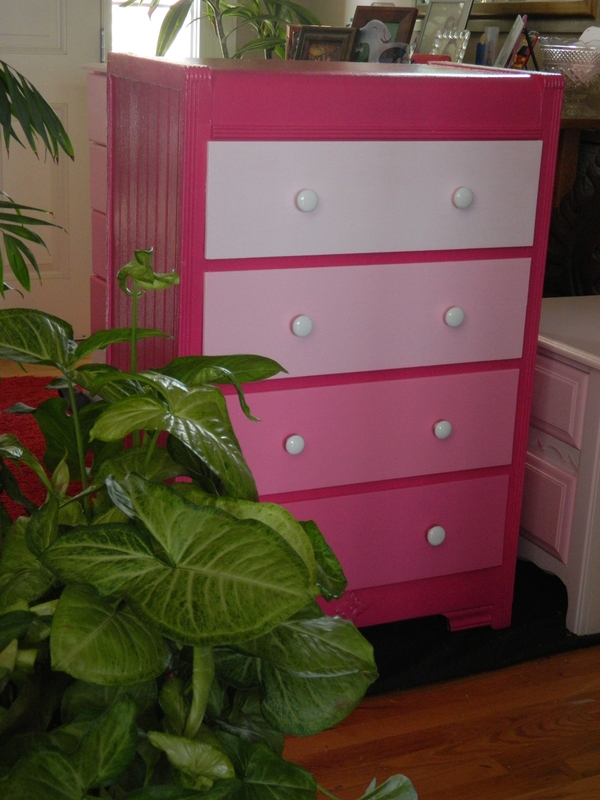 The tall six drawer and its matching nightstand are Broyhill brand, so you know that they a re quality. 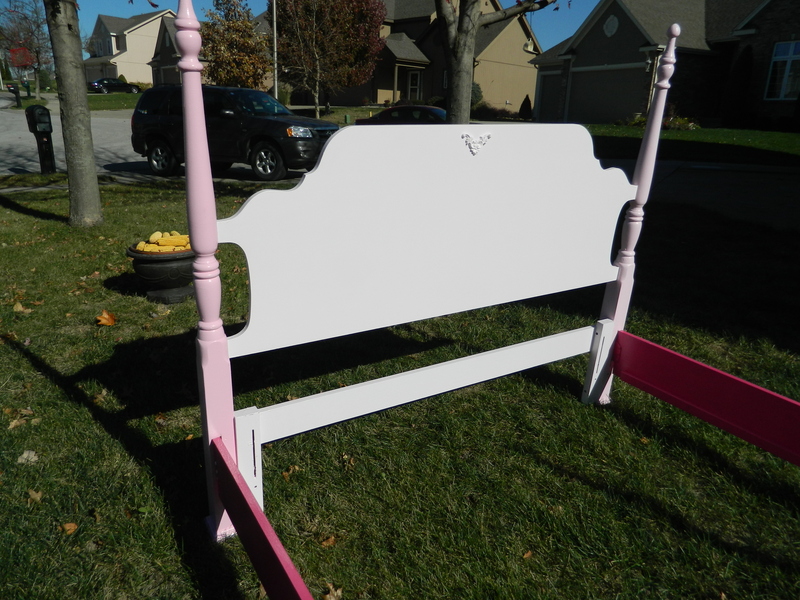 I really like these pieces for a number of reason, including that they are sturdy and quality made yet inexpensive enough to appeal to folks on a budget. Making them over is a breeze and doing 5 pieces at the same time is like a small assembly line for me and The Kid. Because we’ve done this before, we had all the paint and rollers ready to roll. 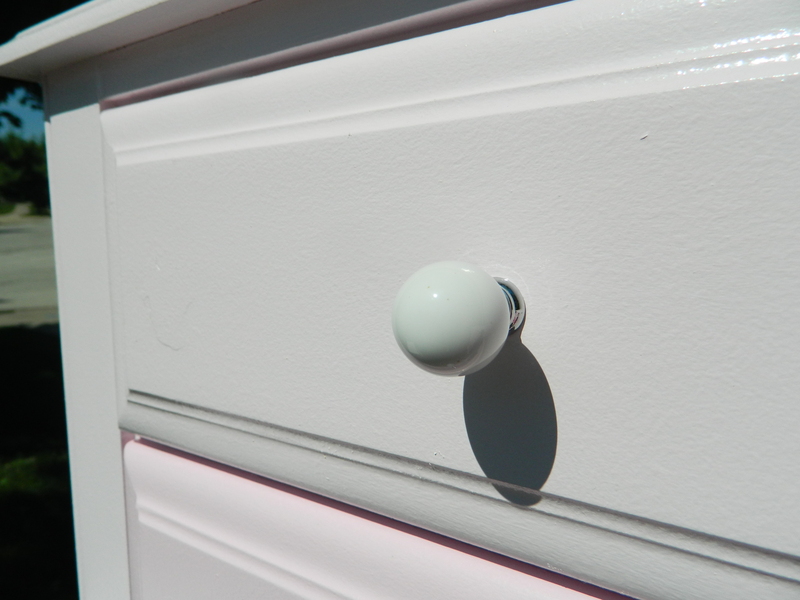 For some odd reason, I had been on eBay and come across these round ceramic knobs and had ordered 30 of them (they came from four different Chinese vendors) and took a while to get here from overseas, but were ready and waiting to be installed on these pieces. 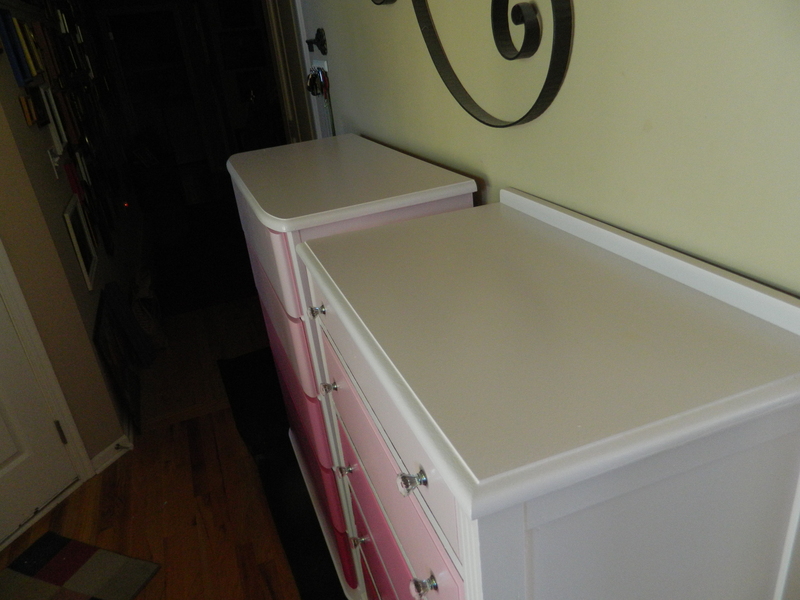 Kind of a coincidence, as I needed 29 – I could have used the final one on the top five-drawer dresser (the right-most piece in the photo above) but elected to use these faux lock piece instead there as well as on the four drawer top drawer. I really kind of like them and will need to hunt down more of them. 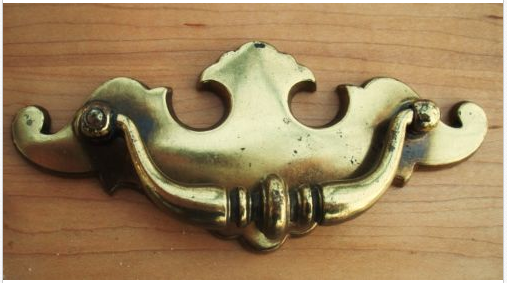 They were the original “dirty brass” color, which I have come to dislike a great deal. I think all of those old hardware pieces are just too common and cheap looking. As a side note, I have collected an almost insane amount of old hardware. 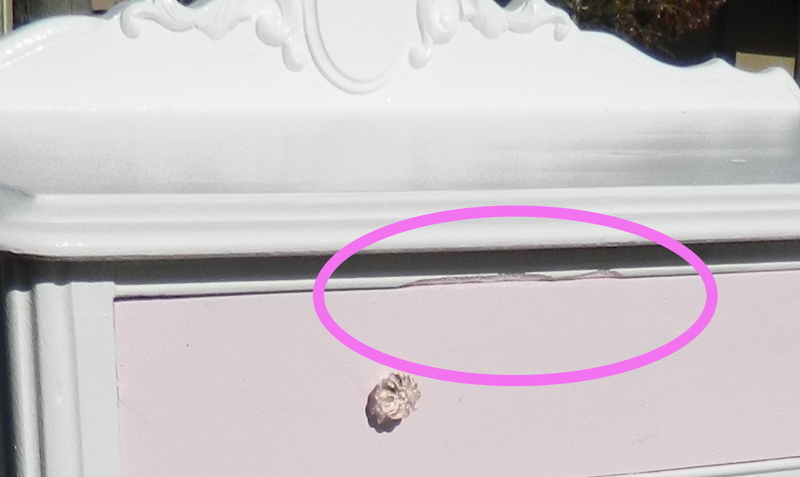 Most come with this familiar and ubiquitous “bat wing” pulls, which I have actually come to loathe. I have to find a way to unload these easily. Not only are they bulky, but they are heavy as well and sometimes trying to sell them online ends up costing the buyer more in shipping than the hardware itself is worth. As a consequence, they often do not sell. 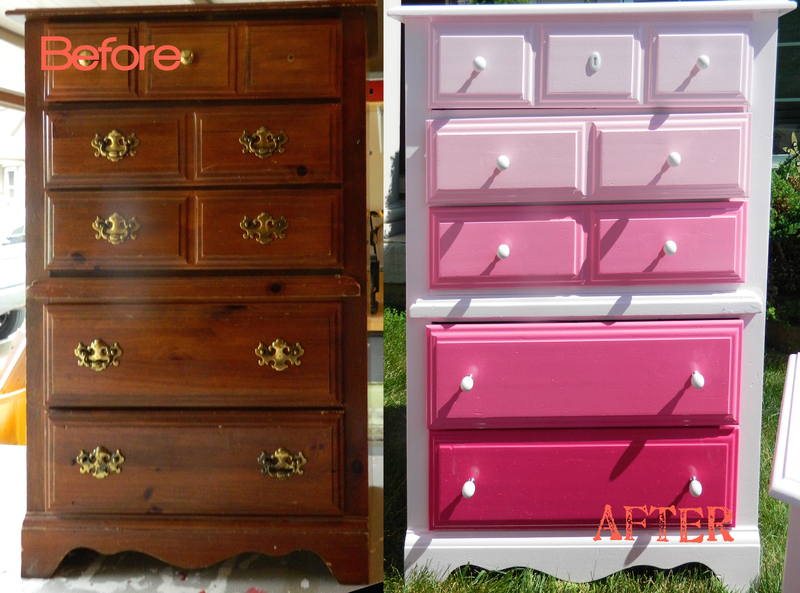 I love to use updated hardware on the furniture pieces that I refinish. And I love the simplicity of the ceramic handles that I’ve used here and the ones I have used previously, which are just slightly different. 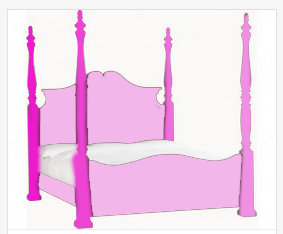 But the pop of the white against the pinks are wonderful, especially the darker pinks. Okay, I’ve rambled on enough for today. I still need to write the ads to list the furniture for sale. Wish me luck that they go quickly. 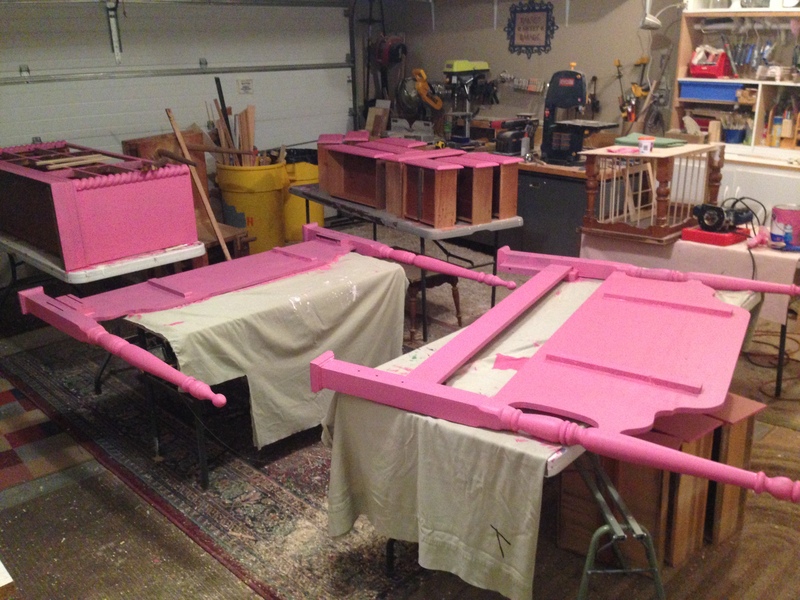 I already have another five projects started in the garage… but these will be other than pink! I am even thinking of some black! PS…for those interested, I am not being paid for nor sponsored in any way for the mention of any products or stores in this post. I just like the way that these particular products work and want to share. 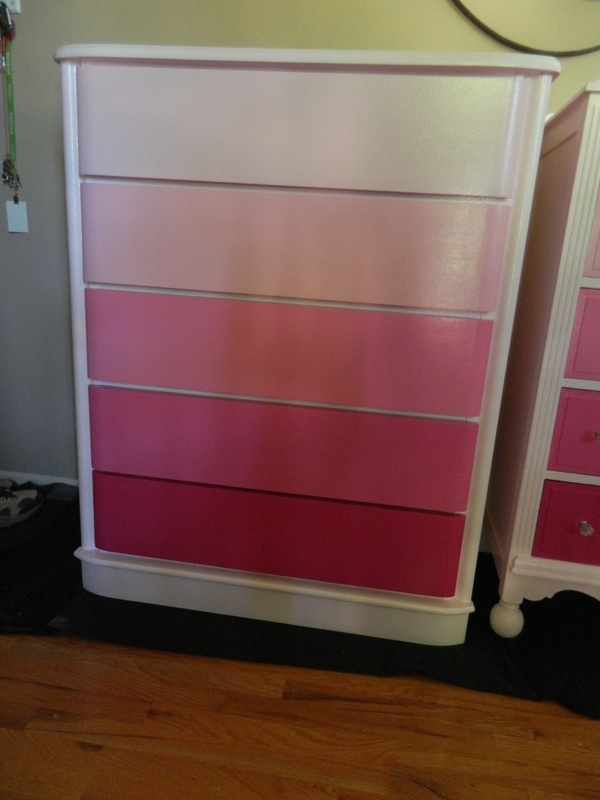 Just a quick post to show you the last two pink ombré dressers that have been completed and are ready for sale. 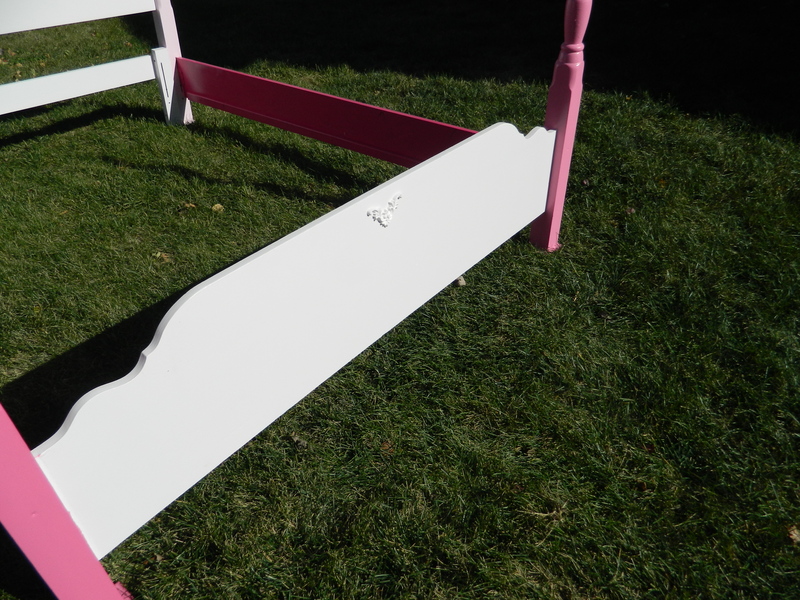 These are so simple, at least for us once we have a routine defined, to clean, fix and then paint. This time was kind of a neat dichotomy of styles in the same finishes, both have their unique charms. 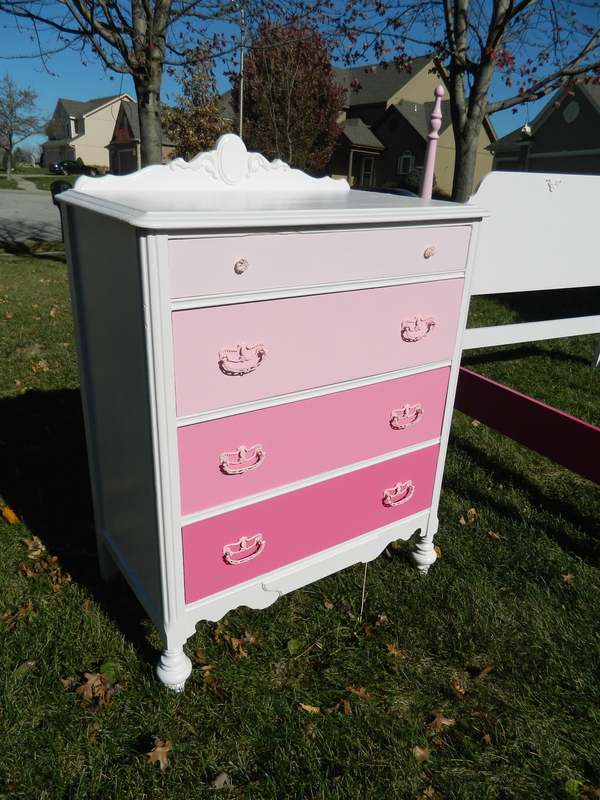 I’ve always been partial to the older, antique styling of the right dresser. 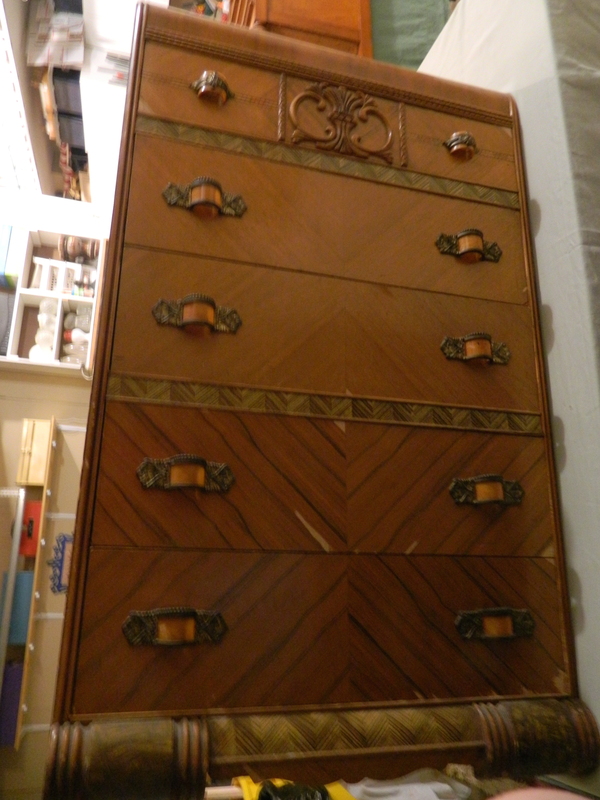 This was in amazing shape for its age, actually has the furniture maker info stamped into the inside of one drawer: Better Kennard’s Furniture Company. It still had working wood wheels on the ball feet! The only work to this one was to replace missing drawer guides. 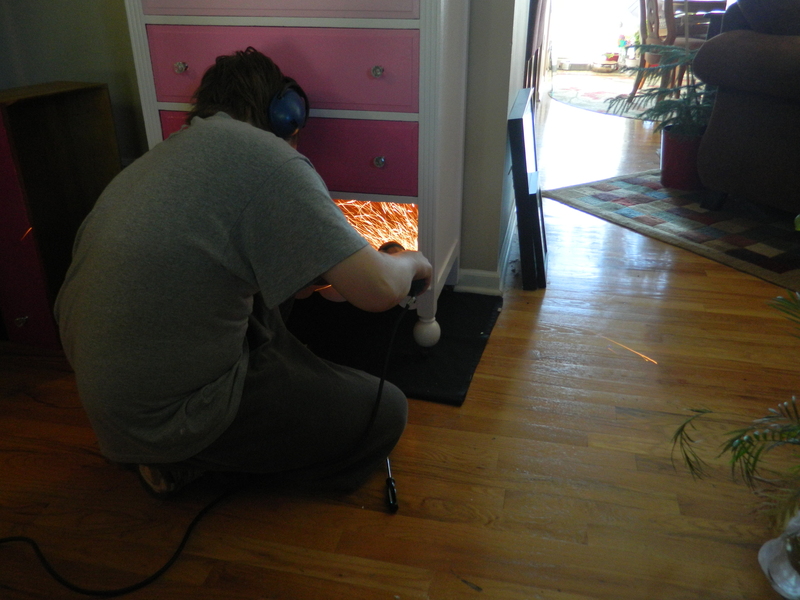 Here is The Kid grinding down one of the guides so that the drawer moved more smoothly. Sparks were flying! 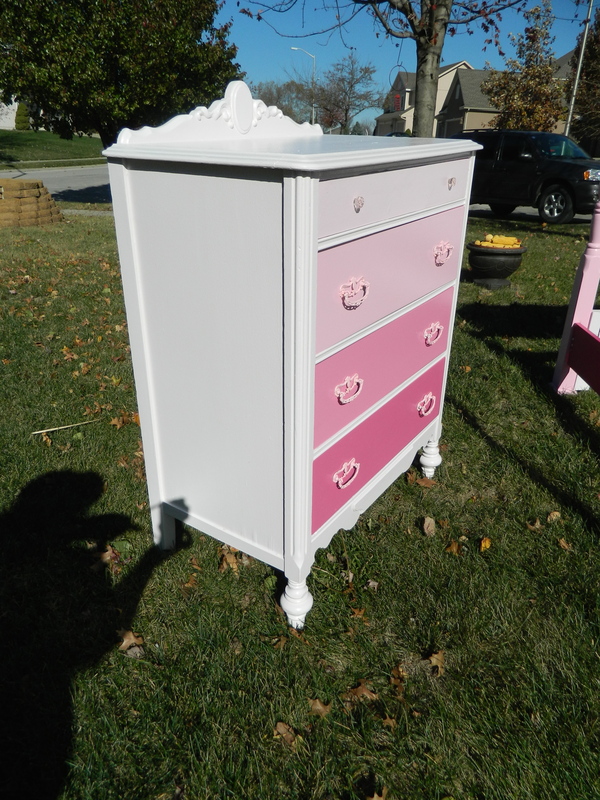 The other dresser is from Bassett. An name easily recognized for quality. 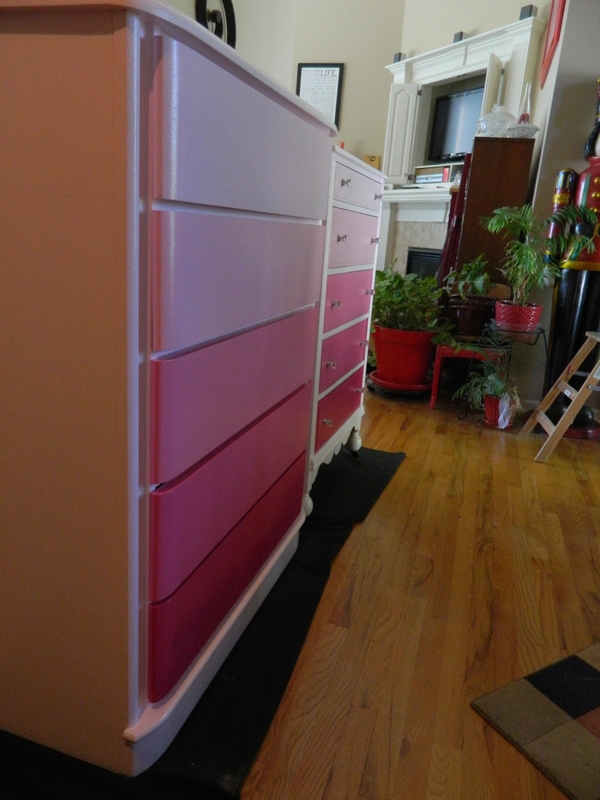 I like the larger roomy drawers and even the smooth face of the drawers as the drawer pulls are built into the bottom of each drawer face. I love the way these colors go on, and they are so shiny! 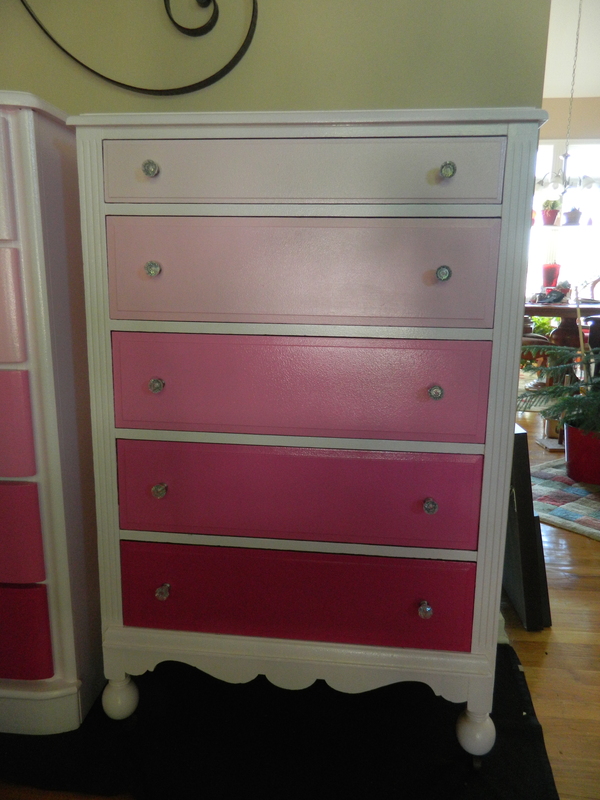 The dresser on the far left is a beauty that I picked up for a mere $20 which has minimal veneer loss. this will be my first restoration piece in many months. I have a nice small supply of various finished veneers that I have been collecting to be able to repair the chips and missing veneer. Garage almost seems like a small assembly line. With The Kid’s help, we are able to complete these quickly without much fuss. I love that the garage makeover has added dramatically to the ease of doing so. We’ve been doing some work and arranging in my computer room as well. Seems my six month long sabbatical is rapidly coming to an end. For those who aren’t aware, I am a full time computer software engineer. I do these projects on the side as my way of reconnecting to my creative side (hence the blog name: On My Creative Side). The projects that I complete are usually sold simply to further fund more projects and at times, it does get expensive. So back to the daily grind. Be sure to stop by again soon. 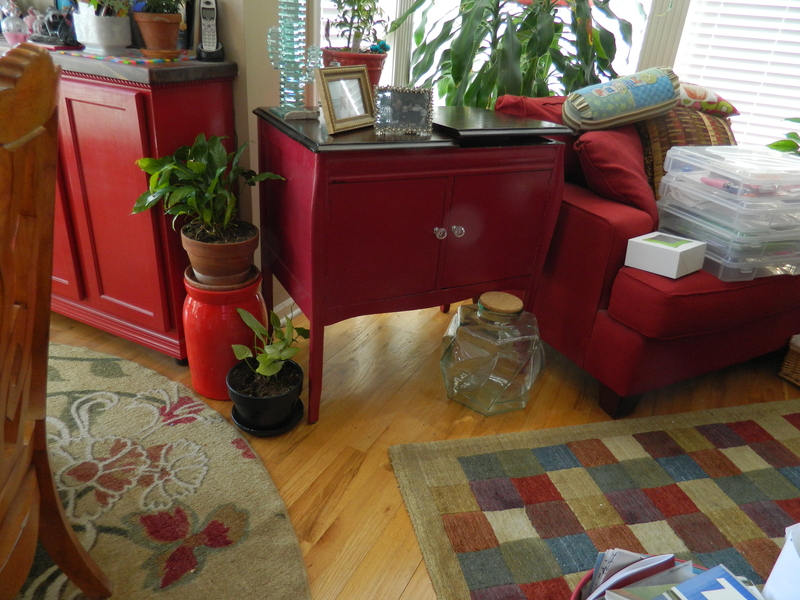 I have the antique chandelier that is almost complete as well as a few other projects. I’ve actually managed to put some time into sewing again, challenging myself (or at least try) to use up my scrap bin. 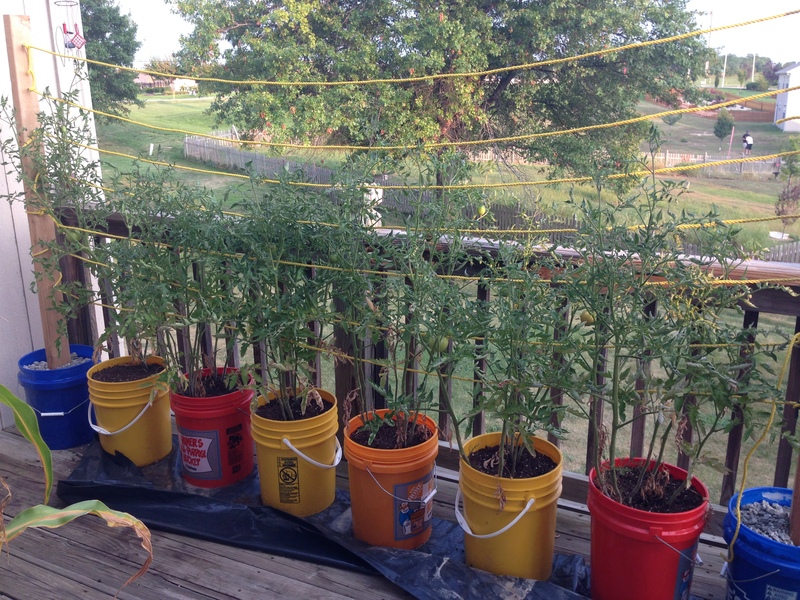 We’re also doing some gardening! Look at our starters! 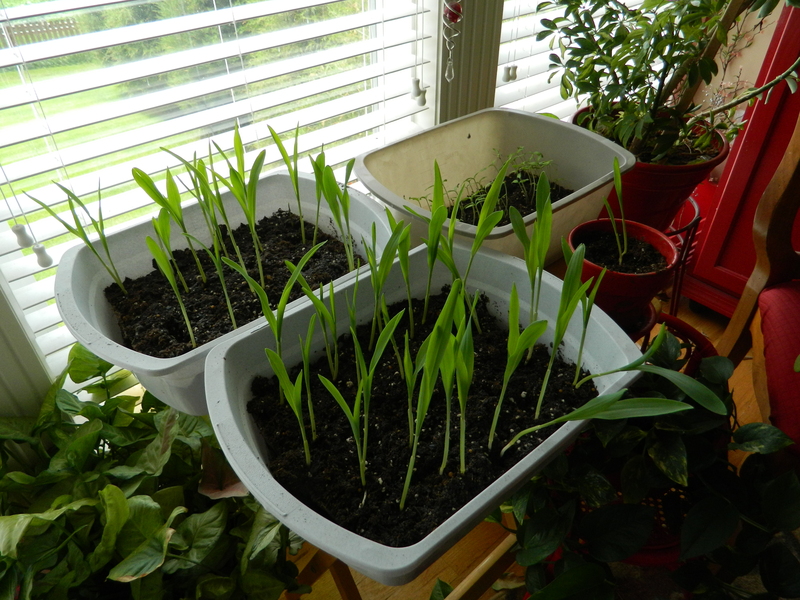 Those are corn (in front) and tomatoes (in back). Now we just need to get the holes dug in the backyard to hold the compost we’ve made from the back deck to the garden and get them planted. It has been almost non-stop rain for the last two weeks and the ground is seriously muddy. 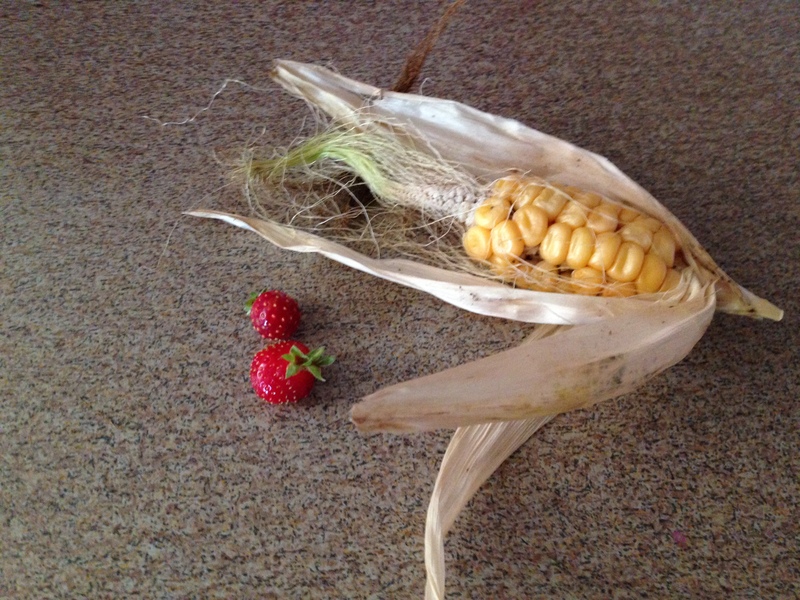 I went out to weed my strawberry patch and with every weed I pulled, I took with it a baseball sized root ball! I stepped into the middle of the patch and sunk to the top of my ankle! 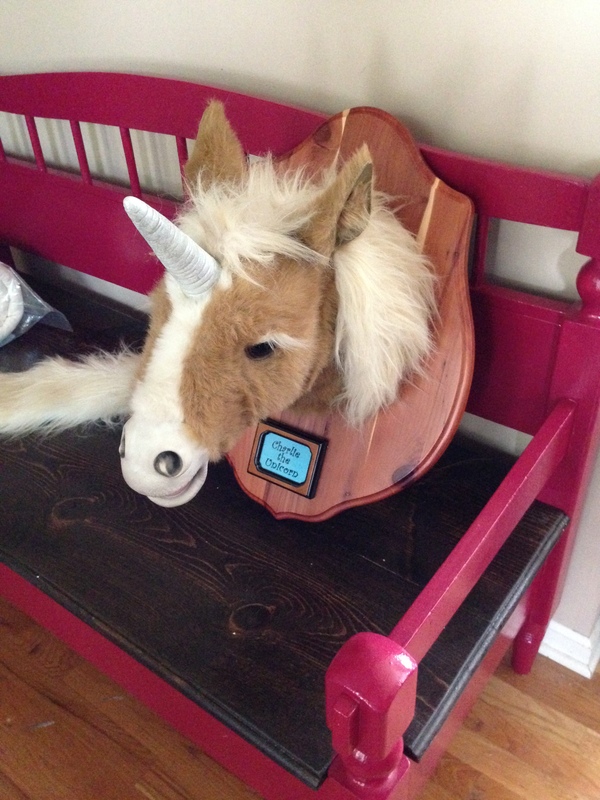 Second Verse, Same As The First… and Charlie The Unicorn! 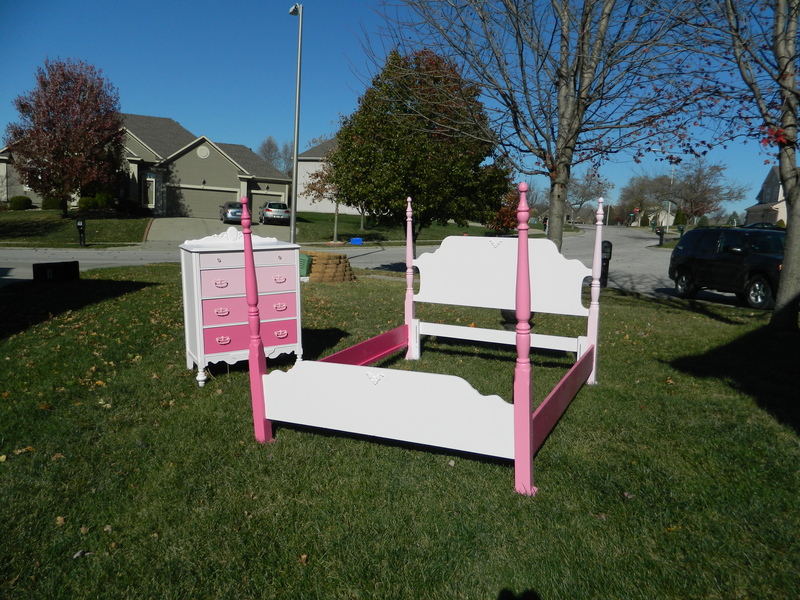 A little over a week ago, I easily sold both of the pink ombré dressers. 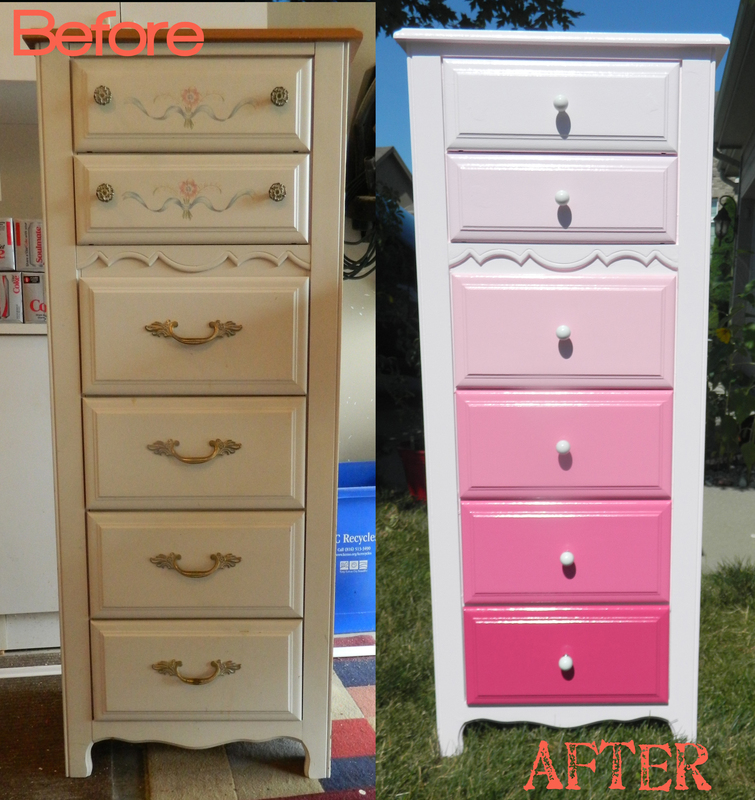 I have done, literally dozens of those dressers and they never fail to surprise me how easily and quickly they sell. You can check them out all over my blog, but here is the latest pair. Well, I had requests this time around to do complete a couple more. 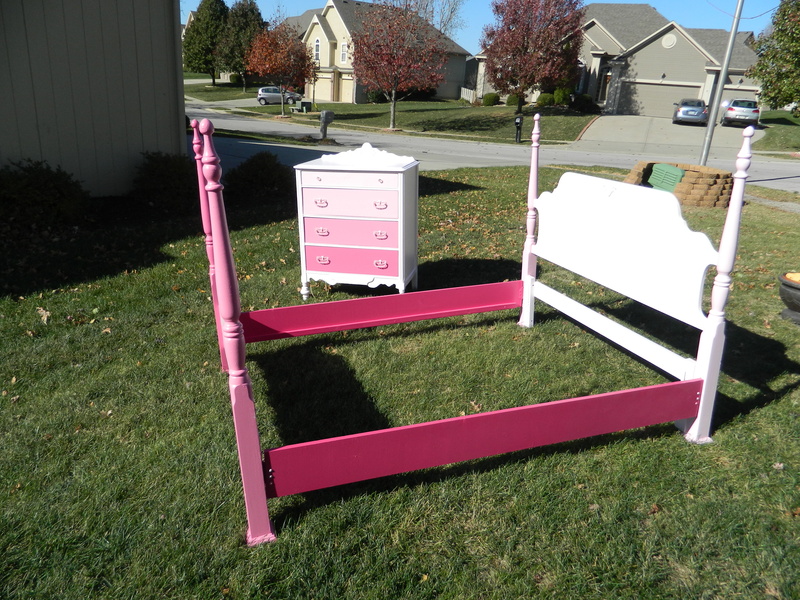 And wouldn’t you know that supplies of dressers have all but disappeared from CraigsList. I’ve been on the hunt big time trying to acquire suitable candidates with price tags that didn’t eat up all the profit. 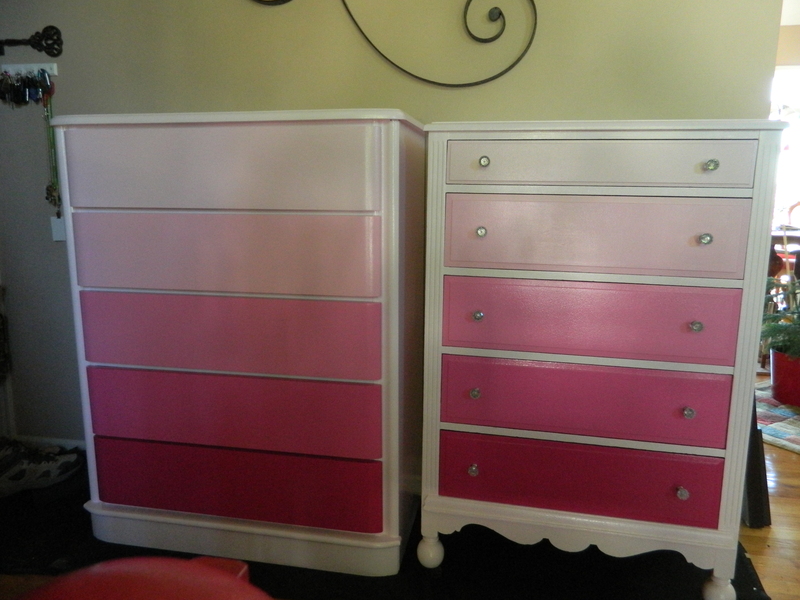 Well, I did manage to put my hands on a couple of very nice dressers (or are they chest of drawers?) and we’ve started the all too familiar process. I am actually letting The Kid have a bit more hands on this time around, so that he is finally earning some of his keep! In the meantime, I have finally finished my secret project. And I have to tell you, it turned out spectacularly! Now, I expect this project to be one of those that people feel pretty strongly about – either they will love it or absolutely hate it. 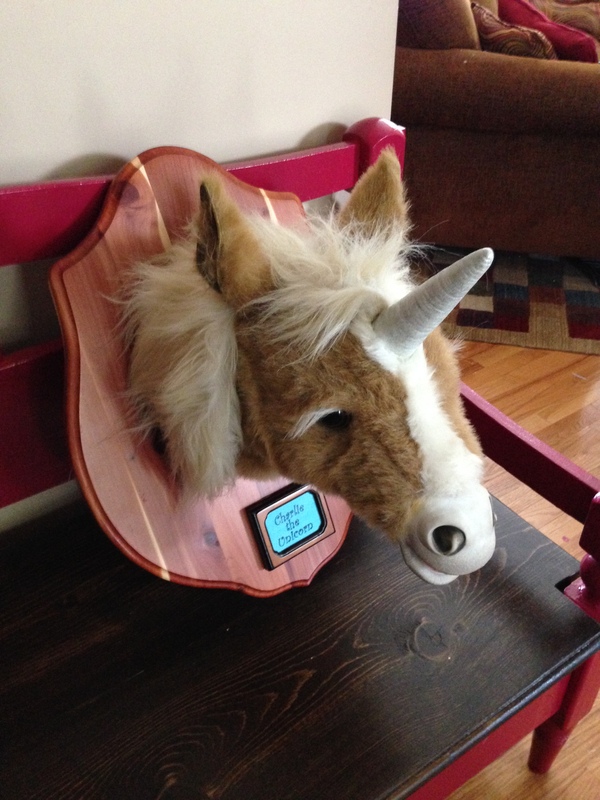 I had the inspiration forever ago but I never could find just the right “animal head” to mount. 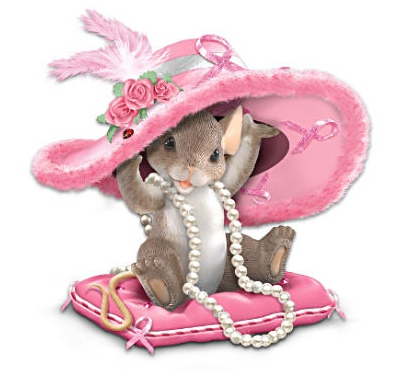 Okay, I admit it is a tiny bit disconcerting and the inspiration piece was a teddy bear, but I love this. There is the littlest inside joke that all my friends who worked on the Copia project will understand. This is how “Charlie” started out. Quite a fascinating toy actually. 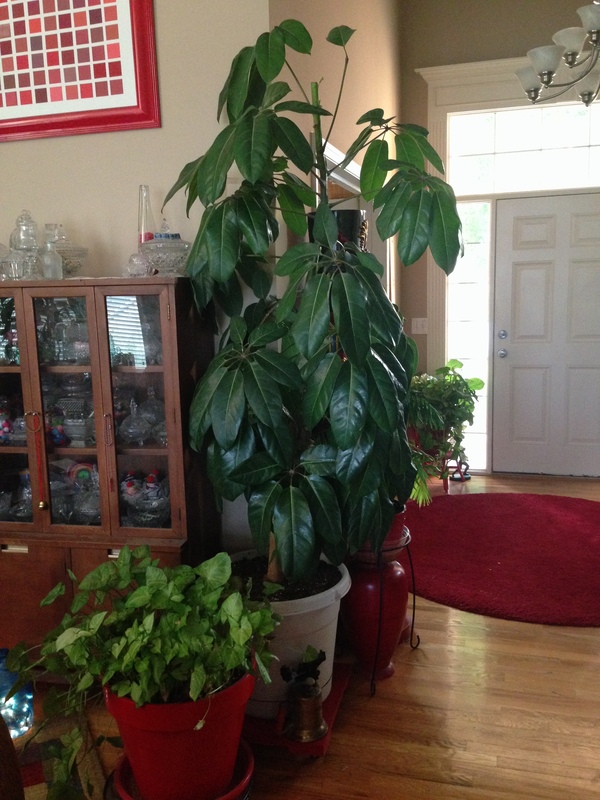 I picked it up off CraigsList (of course) and it had a happy short stay in the living room for a while. As you may recall, the process of getting him to the final stage took some time. It was quite an interesting “autopsy”, fascinating how this thing was put together. We never saw it work, but I suspect that it whinnied and blinked and “chewed” on its accompanying carrot. The little girl who owned the horse was apparently a little hard on it and broke it, pulled off one ear and the tail. 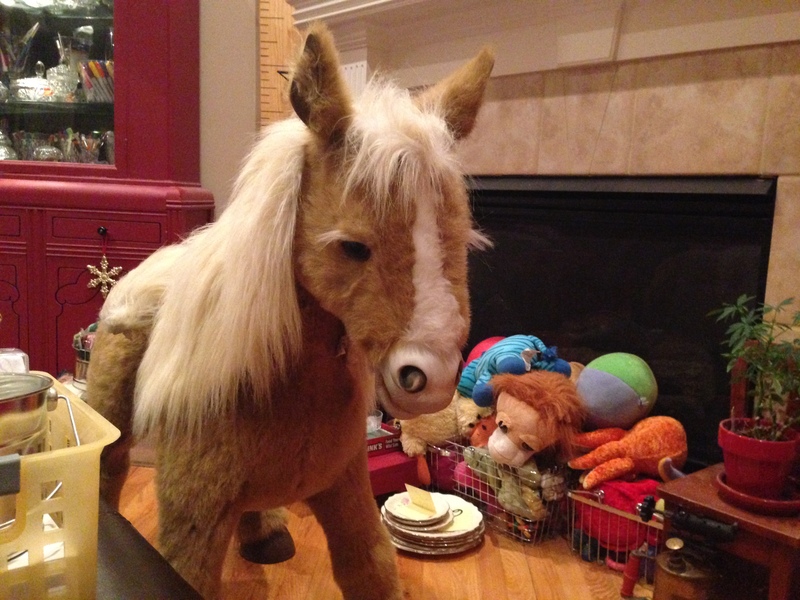 It was decided that the little horse had to go. “Charlie” spent quite a bit of time on the floor in front of the television. The Kid found the thing to be quite disconcerting, as it would be the first thing he saw in the morning as he headed downstairs and made the first turn towards the kitchen. 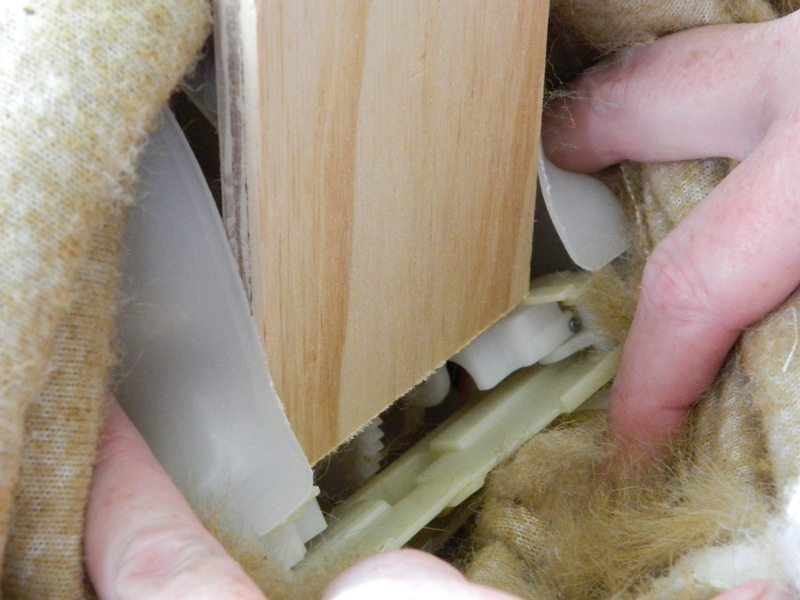 Once I managed to break all the connections and unscrew his support from the body, it almost was worse. Much like the scene from “Godfather” when the man wakes up to the horse’s head in his bed, this thing laid on the couch of the footstool for while as I figured out how to finish the project. So, with his head removed, I had to figure out how to mount the head on the board. I picked that beautiful board at an online auction, I knew it was destined for better things. It was tough, as well, working inside the neck of that thing, it really took two pairs of hands to make it work. But I finally figured out how to get a support mounted to the base of the head. I held it and The Kid first screwed it into place and then we used expanding foam to fill up the space and to cement the connection with the head. Even though it is meant to hang on a wall, I wanted it to be rock solid and not just “fall off” some night. Then it was just a matter of tucking the ends of his fur and mane to make it look nice and seamless.Then it was time to turn the horse into a unicorn. 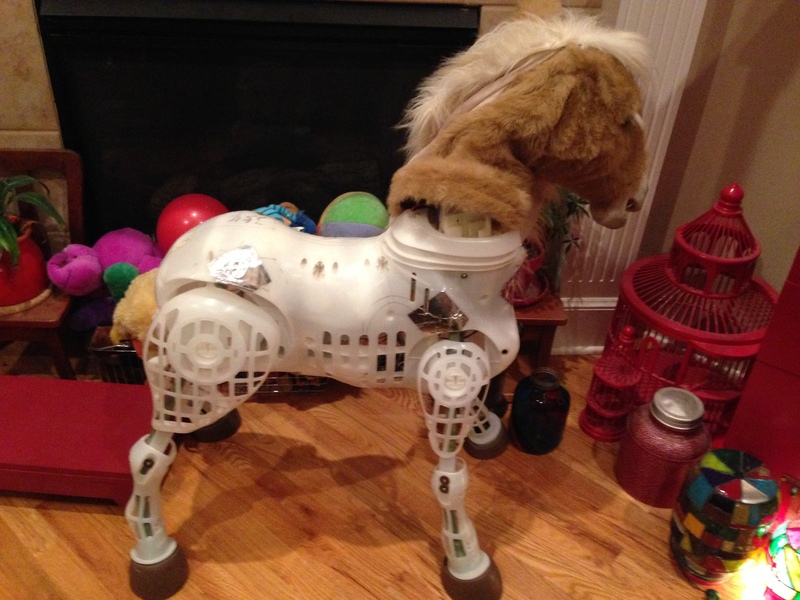 The little horse actually came with a brush and a carrot, both I suspect triggered some kind of response in the piece – like a whinny or a chewing motion. We never did get to see the little guy work. I searched and searched for something to use as his horn. I thought that a glass ornament might be the perfect solution, but in this off season, I wasn’t finding anything. Especially the scale that I needed. Then I remembered his little carrot. After sawing off the ‘leaves’ end of the carrot and making it flat, I spray painted it ivory and following by a healthy sprinkling of glitter. 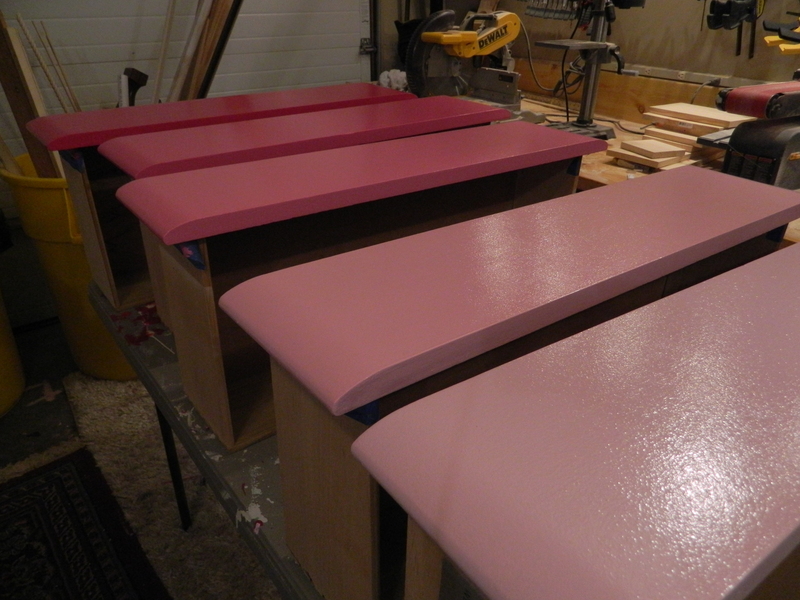 Then a couple of sealant coats and it was perfect! I made a slit just large enough to wiggle the end through the fabric and glue it to the framework of his head. Viola! 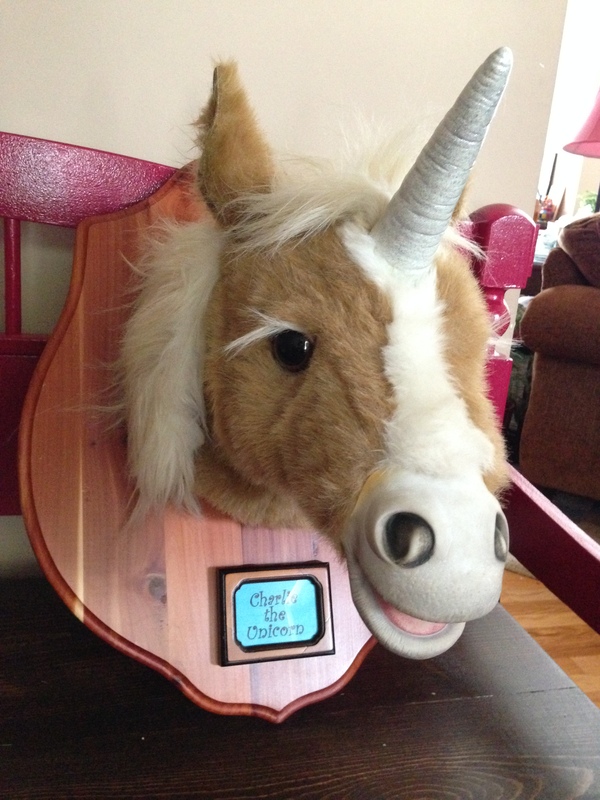 Charlie the Unicorn was born. I think it turned out fantastic! I did notice, however, that once the head was successfully mounted, it was quite centered up and down, so I took the opportunity to add a little name plate. I had the little wood frame and it was just a matter of printing out his name with a great font. Now I want to hang Charlie in a place where lots of people may see him. We have a six foot tall nutcracker that always stands in the foyer and I thought Charlie would be the perfect thing to stand guard with “Arthur”. The Kid is vehemently arguing that it be anywhere than a place that he will see it constantly. Even after completing it, he says it still gives him the “creeps”. So, I find in my experience of crafting and making things, that sometimes you may do certain projects over and over (that is, after all, my bread and butter) to generate the money necessary to do the fun projects. 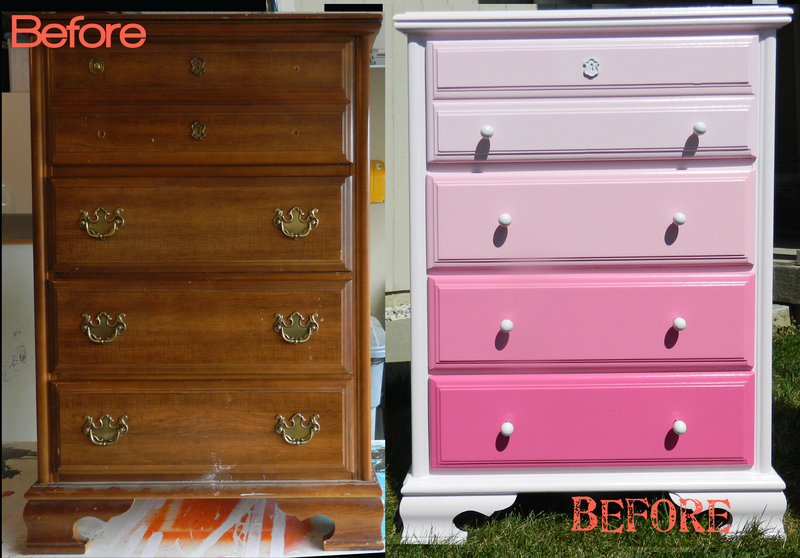 I still am amazed every single time I finish an ombré dresser just how gorgeous – especially in the pinks – that style is. So, am very interested in hearing what you think of Charlie. Please, take a minute to comment? After all, as another blogger that I respect, it is the way the audience shows me love!